Quite Dapper! Did you know that there is a Dapper Day at Disneyland? A day to dress your best! And what better way to dress your best than by wearing our Dapped Cable Chain! What exactly is Dapped chain? Dapping is where a single hammer strike creates a “mark” in the links that cause it to reflect light. 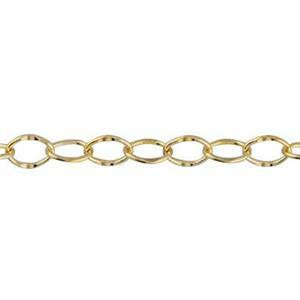 Striking is the perfect word to describe our 31212P – 14/20 Yellow Gold-Filled 2.2mm Tiny Dapped Cable Chain. A gorgeous chain to add to your bulk jewelry supplies. Theme Parks strictly optional. We also carry it in Sterling Silver 2.2mm Tiny Dapped Cable Chain. I only use gold filled or sterling silver chain when I make jewelry and the Tiny Dapper works fine and it is affordable.